Mama Mulate is a recurring character in my series set in New Orleans and first appeared in Big Easy, French Quarter Mystery No. 1. Mama has a Ph.D. in English literature from the University of South Carolina where she was a star on their track team. She’s tall and slender with hair that flows over her shoulders and skin the color of café au lait. 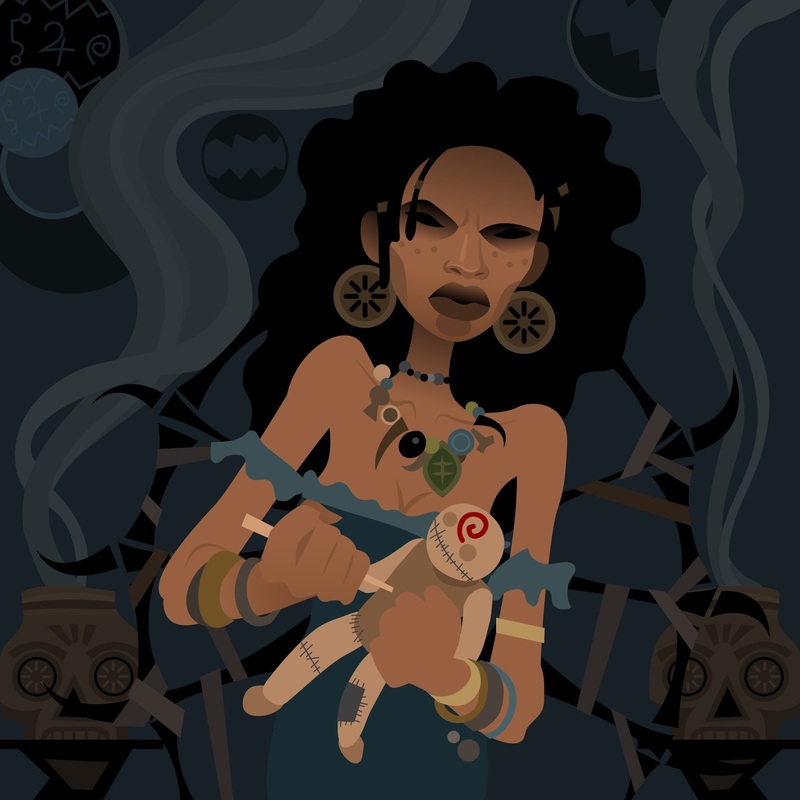 Mama teaches at Tulane University and has a dark secret she keeps from the administration: she is a practicing voodoo mambo. Though attractive and highly intelligent, Mama is single, living alone in an old New Orleans’ neighborhood along with her three cats. The Conjure Man Zekiel also appears in my novel A Gathering of Diamonds set in the Ouachita Mountains of Arkansas. How can he live in two places? Well, perhaps by magic. Mama has an eye for men, some of them, like Cray Toussaint, younger than she is. Cray is an interesting character: a young, black bartender who studied poetry at Tulane. 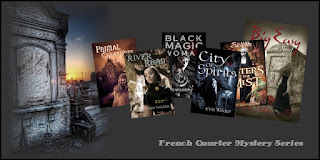 Conjure Man is Cray’s only appearance in my series set in paranormal New Orleans. At least so far. Mama Mulate’s temples throbbed from a bad migraine. She’d thought about going straight home, but it was Monday, and she always went to Pascale’s for oysters and beer. Despite her headache and drumming of rain on her windshield, she felt ready for a break. One of her favorite ex-students shucked oysters in the bar, and that helped seal her decision. She swallowed three aspirins and found a spot for her fully restored 1960 Bugeye Sprite in an empty parking lot. Cray Toussaint greeted her when she entered the restaurant. Cray poured the local brew from the tap behind the bar. Before he handed the chilled mug to Mama Mulate, he shucked a single oyster and dropped the tasty mollusk into a vodka-filled shot glass. “Haven’t heard that word in a while,” Cray said as he began shucking Mama’s oysters. By ten, Mama and Cray had polished off three dozen oysters, half a dozen oyster shooters and a gallon or so of Dixie Beer. A window was half-cracked and curtains flapped in the breeze as they held hands and stared into each other’s eyes. “Your last poem was superb,” Mama said. Talk of Mama’s errant daughter brought a chill to the conversation, accompanied by a clap of thunder, along with wind and rain pounding windows and front door. Feeling the chill, Cray changed the subject. Despite Cray’s continued protests, Mama finished her beer and left the restaurant, driving alone to her old two-story house. She found a late model Land Rover parked in the driveway, a somber couple waiting in the front seat. As a voodoo mambo, Mama ministered to the needy masses at almost any hour. This couple was white. They followed Mama through the rain to the screened front porch. “I’m John McGinty and this is my wife, Susan. I know it’s late, but we need your help,” the man said as Mama pushed the creaky screen door shut with her shoulder. John and Susan were an attractive, middle-aged couple—a financially successful couple from the looks of their expensive Land Rover parked in the driveway. Despite the beer and oyster shooters, Mama Mulate was largely sober. “We’ll pay whatever it takes,” John McGinty said. In the tradition of Marie Laveau and other famous New Orleans’ voodoo practitioners, Mama subsidized her Tulane English professor salary by accepting money for her voodoo spells and potions. Knowing without looking the amount would be sufficient, she took McGinty’s check and stowed it in her kitchen teapot. She returned with a large bottle of rum as thunder rumbled the walls of the house. New Orleans below sea level, the streets had begun to flood as Mama and the McGinty’s leave the house. The sky was black, strong wind blowing up from the Gulf. They headed out of town, toward Gonzales, accompanied by only a few large trucks on the highway. An hour had passed before Mama spoke. John McGinty steered the Land Rover onto a dirt road, barely visible from the highway and crossed the raging canal on a wooden bridge. The road led through a desolate swamp. It was the city’s storm overflow area that diverted water when flooding occurred. McGinty followed the dirt road for two miles. They found the shack around an abrupt bend. An old black man sat in a rocking chair on its covered front porch. A lop-eared hound sat at his feet and a black cat whose tail looped like a question mark over its back. The old man pulled himself up from the rocker and crossed the porch with the help of a cane. Stooping with age, he seemed to have no meat on his little body, just sinew, and tendons and furrowed skin stretched tightly over his ancient bones. The McGinty’s exchanged dubious glances, apparently wondering if they’d wasted their time and money. “You knew we were coming?” John McGinty asked. Zekiel's accent was straight from the bayous of south Louisiana but imprinted with a hillbilly twang. Despite his obvious age, his voice was deep and clear, as were his anomalous blue eyes. Mama and the McGinty’s followed him into the shack. Semis passing on the highway melded with the wind whistling through pine boughs. The black cat rushed between Mama’s feet, slipping through the screen door before it shut. As if acknowledging their names, Baxter barked, and Pancho rubbed against the old man’s legs. The shack was small and dark; weathered cardboard papered its thin walls. A flowered curtain suspended from a wire quartered the single room. An old army green cot marked the spot where Zekiel slept. There was no indoor plumbing. A table of stained oak occupied the center of the room. On the table, a coal oil lantern flickered in an updraft. Scattered papers, various gemstones and an old microscope lay strewn on the table. Boxes of old newspapers and magazines littered the floor, and various bottles containing who-knows-what lined the walls with homemade shelves. Zekiel ambled over to a squatty icebox in a corner—a white porcelain icebox chipped and yellowed with time. He returned with cold drinks for the McGinty’s and a ceramic jug. Removing the cork from the jug, he tipped it over his shoulder until clear liquid dribbled down his face. He handed it to Mama. Mama tipped the jug, instantly tasting some unknown fiery liquor. Zekiel gripped it in his gnarled hand, holding it until a near-lethal amount passed her lips. Then he took two dark stones from a cigar box on the table. He cleared a spot with his forearm and held the two stones about six inches apart. They clashed together with a loud click when he released them. “What power? Other stones have no such power, “John McGinty said. Zekiel reached in his cigar box, this time producing a blood red gem. Next to the lamp sat a glass of water. Water in the glass plunked when he dropped the red stone into it. Within seconds, heavy raindrops began pelting the shack's tin roof as lightning flashed across the dirty window pane. The fetid odor of damp soil and crackling ozone flushed like a wave through cracks in the wall. Again, John McGinty glanced at his wife. This time her look was different. Zekiel drew a deep breath. Dark skin, visible through the vee in his shirt, stretched across his ribs as he removed a crystal ball from a wooden box. Metallic needles pierced the ball. Placing it on an ebony stand, he drank again from the moonshine. “I needs your help,” he said. “Tell us what to do,” Mama said, drawing closer to the table. Zekiel cocked his head and stared at Susan McGinty as if waiting for an answer to an unspoken question. Throbs of glowing red danced on the shack's dark wall. Outside, rain pummeled the windows and drummed on the tin roof. Zekiel kept up a low-voiced banter, imploring them to stare at the crystal ball. Soon, his words became a subliminal message. The crystal ball turned black. Clouds parted, and everyone’s gaze penetrated the sphere. In it, they saw a vivid panorama of another place and time. The image of a young man appeared. He was alone, draped in darkness and water up to his neck. As they watched, he closed his eyes and disappeared beneath the water’s choppy surface. An explosion of noise jolted them back to reality. Nearby lightning had struck a tall pine outside the window. As Mama watched, John and Susan held each other, sobbing uncontrollably. Zekiel stood from the table and drew Mama aside. The morning had dawned before the McGinty’s, and Mama arrived back at her house. The hurricane had moved west toward the Texas coast and had miraculously missed New Orleans. All that remained was a dark sky filled with darker clouds. Slow rain would continue throughout the day. Mama didn’t expect John and Susan McGinty’s reaction when. “They never found his body. We thought he might somehow have survived,” John McGinty added. “Now we can have a proper memorial service for him,” Susan McGinty said. The McGinty’s had found their closure Mama thought as she watched them drive away. The experience forced her to consider her daughter. Later that day, she returned alone to Zekiel’s shack. This time she took two sacks of groceries, two bags of ice and a fifth of Jack Daniels. Zekiel, Pancho, and Baxter were waiting on the porch. The old man grinned when she climbed out of her Sprite. Mama followed Zekiel into the shack. After stowing the canned goods, she presented him with the bottle of Jack Daniels. Storm clouds had cleared when Mama Mulate returned to New Orleans. She had lowered the top of the Bugeye Sprite to let her long hair blow in the breeze beneath a cloudless blue sky. When she got home, she would call the Brown Hen Restaurant in Mobile and talk to her daughter. Tell her she loved her and that she supported any decision about her life she may have made. After that, an out-of-character Tuesday visit to Pascale’s, a dozen oysters, and cold Dixie seemed inviting. Who knows, she thought—maybe she would even invite Trey back to her house to recite poetry. Though mirlitons, also called Chayotes, are originally from Mexico and Central America, they have found a home in Mama Mulate’s backyard. Mama teaches English literature at Tulane University in New Orleans. She’s also a practicing voodoo mambo, business partner and confidante to Wyatt Thomas, the French Quarter’s favorite private investigator. 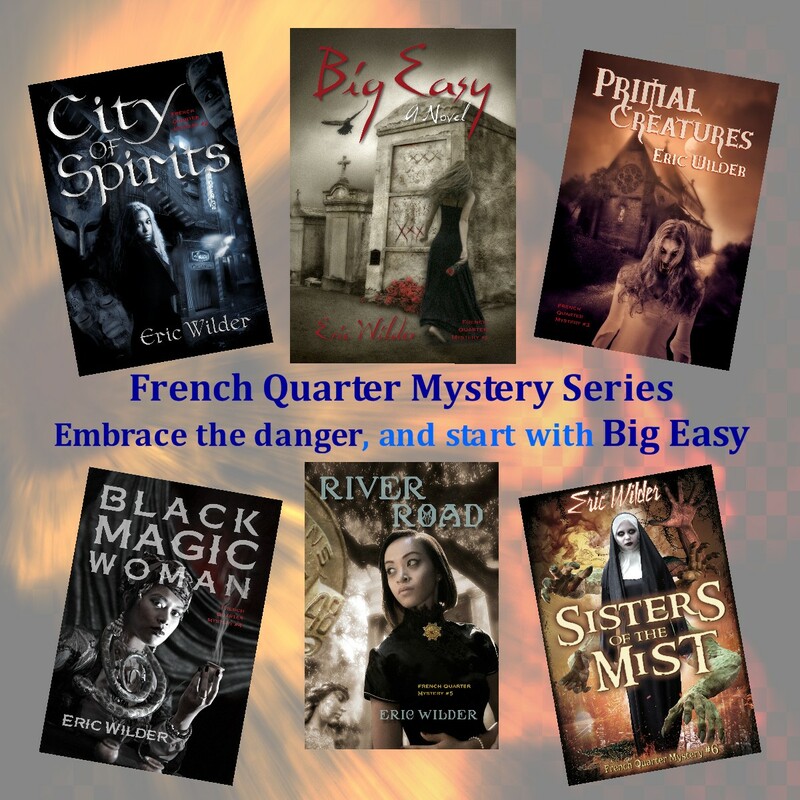 Mama and Wyatt come alive in Eric Wilder’s French Quarter Mystery series. Fictional maybe, but this is one of Mama’s favorite mirliton recipes. Boil mirlitons in salty water until tender. Peel and cube the pulp. In a skillet, using butter, sauté green onions, onions, bell pepper, celery, and parsley. Add shrimp and cook 10 minutes. Add mirliton, garlic powder, salt, and pepper to taste, and then mix well. Pour into large casserole dish, sprinkle with breadcrumbs. In an oven preheated to 350 degrees, bake the ingredients 30 minutes, or until top is golden brown. Enjoy! Mama Mulate is a recurring character in Eric Wilder's French Quarter Mystery Series set in New Orleans. Please check his Amazon, Barnes & Noble, and iBook author pages.